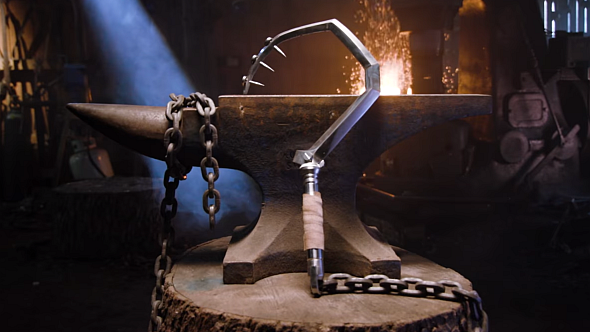 Man At Arms is a YouTube series in which some very skilled blacksmiths make real life versions of gaming’s most iconic – and impractical – weapons. To celebrate Overwatch’s recent one-year anniversary, they actually built Roadhog’s hook. Jeff has suggested Roadhog may get a buff. For all the latest happenings in Overwatch, check out our update tracker. As ever, this YouTube series is a fascinating look at the tools and processes involved in modern blacksmithing. As no more than an interested layman, I don’t really understand most of the terminology used, but it’s nonetheless really cool to see a nondescript lump of metal slowly take the shape of something I’ve thrown about in a videogame. Each video has a scene at the end where the smiths try to use the weapon in real life. Sadly, none of them even attempt to land a throw with the hook, but you still wouldn’t want to be on the receiving end of a swing. It can really mess up a milk bottle. Overwatch fans can also check out Genji’s Sword. The show has been going a while now and forged many more of gaming’s most iconic weapons – they did Sephiroth’s Masamuneand Cloud’s Buster Swordin the very first series, for instance. In my opinion though, their best episode so far was their hundredth, in which they made achainsword from Warhammer 40k. Amazing stuff.